Chase Manstedt, CFO enjoys walking in the parade with his family. 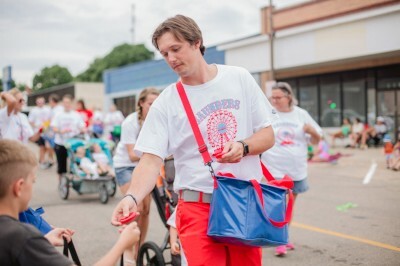 Doctors, nurses, staff all joined in the fun at the Wahoo Parade this summer! Enjoy life to the fullest. Be as healthy as possible. We are here when you need us to Be Well. Saunders Medical Center was created to improve the health of our community. Superb physicians, nurses, and staff have chosen to care for patients at SMC rather then a large facility. They see the value in knowing their patients and their families as neighbors. They truly care. All under one roof, we offer a SURGERY CENTER, PHYSICAL THERAPY CENTER, FAMILY CLINIC, and a NURSING HOME. We serve our community from the very young to the very wise! With providers that care about the complete family. Our nursing home "Long Term Care" is advantageous compared to other facilities as your mom and dad never need to leave the center for their care. This is especially necessary in the ever changing Nebraska weather....a simple walk down to another wing and care is here! The leadership at SMC works diligently at creating programs to benefit the community. Employees in all positions find ways to better serve their patients and continually improve their work and care for you. They work with passion to provide the latest technologies and most caring spirit possible. The MULTIPLE SCLEROSIS CLINIC is just one of the great examples of SMC providing specialized premier care.